Often overshadowed by Marrakech, Fez is a charming small city that is just as impressive to outsiders. Located in the northern region of Morocco, the city is surrounded by hilly terrain and woodlands, making it one of the prettiest places to be in the area. But what makes the city stand out among the others to make it worth going out of your way to travel to? You’re about to find out. 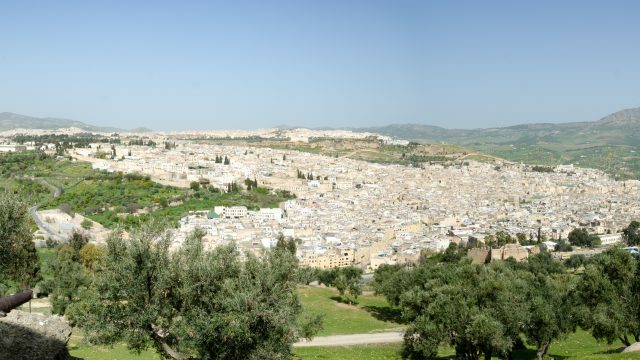 Here are the five reasons travelers love to explore Fez. 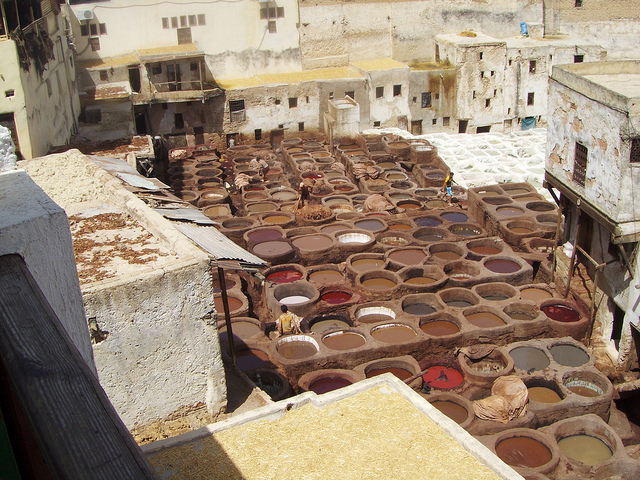 If you know anything about Fez, you’ll know it’s home to famous tanneries. When walking through souks in Morocco, you’ll find gorgeously-dyed leather shoes, handbags and wallets ranging in many colors from burnt sienna to bright fuchsia. Those souvenirs most likely were brought in from Fez where they were made. Take a walk through the rooftop of the buildings or second-floor walkways surrounding the tanneries and it’ll be a marvelous sight to see. You’ll find workers with stained hands working hard in the sun dyeing the leather, a sight you’d be hard-pressed to find anywhere else in the world. Nearby, you’ll find plenty of shops selling the goods for you to nab a piece to bring back home. 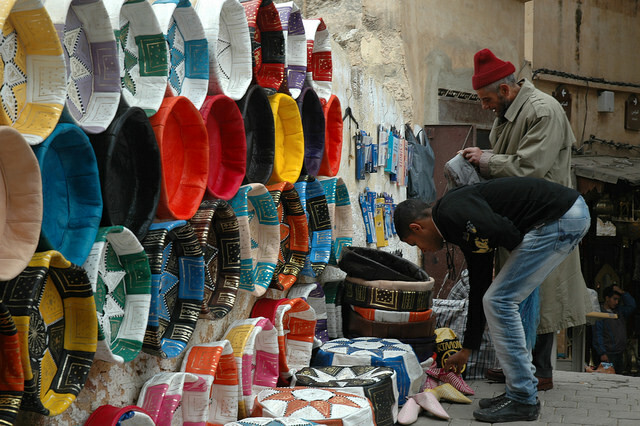 Unlike Marrakech, Fez is a largely no-frills city. Because other cities receive more tourists, locals and businesses tend to cater to them, often “softening” or “glitzing” up the experience to make it more appealing to tourists. 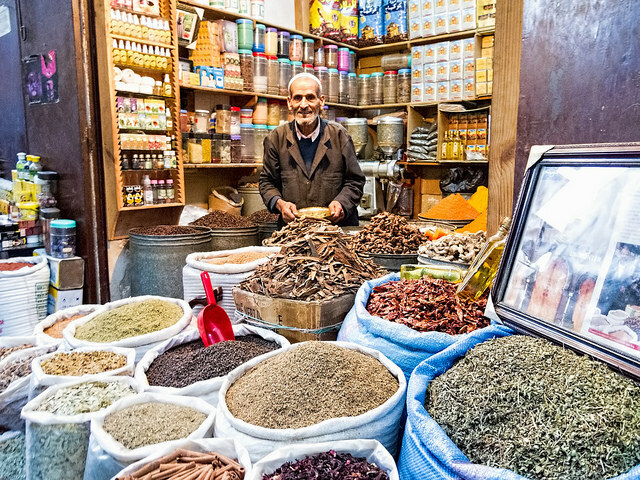 In Fez, the city is more under-the-radar, so when wandering around, you’ll experience more of what it’s like to be a local. You’ll meet friendly vendors selling spices, copper pots, leather goods and more. And you’ll eat authentic meals in cafes that didn’t adjust the menu for people who can’t handle spices. Walk around other cities and you’ll find newer buildings that are obviously inspired by the West. 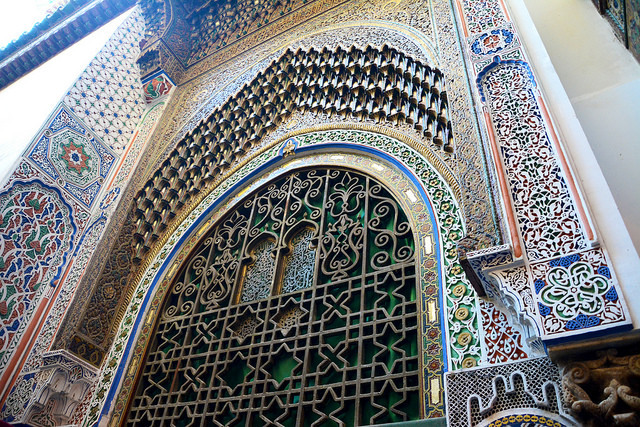 But if you’re longing for authentic Moroccan architecture, you’ll find it in the walled city of Fez. Take a stroll on the narrow streets and look for stunning details (you’d be surprised how breathtaking random doors and windows are). Fez is ancient with mosaic art, arched doorways, and lovely iron works. The fun perks of exploring a walled, ancient city is never knowing exactly what you’ll find around the corner (and don’t forget to keep that camera handy). 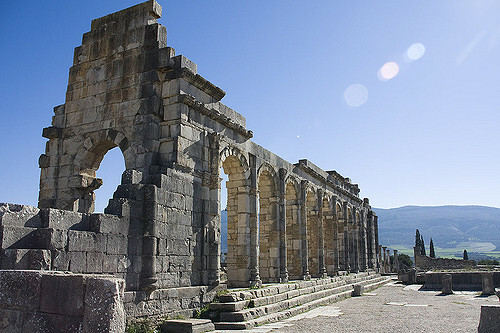 While exploring the Medieval walls of Fez is a fantastic historical experience, you’ll want to visit the Roman Ruins of Volubilis (technically a bit closer to Meknes) for a much more ancient atmosphere. A short drive outside of the city will take you to the countryside to the ruins where you’ll see remnants of a third century empire that is left in shambles (but remarkably in good shape considering how old it is). The ruins are open to the public to explore and imagine what life looked like back in the day when the Romans ruled the land. The Medina is known to be one of the oldest and largest in the world, and you’ll definitely get that vibe walking around the area. Expect to find vendors selling artisanal goods like scarves, rugs, leather goods, woven bowls, shoes, kaftans, spices and much more. Look for bakeries within the Medina, they are known for having some of the most aromatic sweets and freshly-baked breads that you can sample. Common flavors used in the baked goods include pistachios, honey, dates and jasmine. Don’t be surprised to find random donkeys, chickens and horses browsing through the shops — its all part of its charm that makes the city it is today.